Informal 12 acre garden with rare shrubs and trees, and stream and woodland area. On a very grand scale indeed, this 12 acre garden surrounding an unusual Portuguese style house is a place to experience unforgettable sights, scents and sounds. It would be worth a visit for gorgeous hydrangea ‘Sea Foam’ alone, glimmering with flowers in dappled shade , to meet the original of the elder S‘Guincho Purple’ or to discover the newly created rock pool fringed with primula. 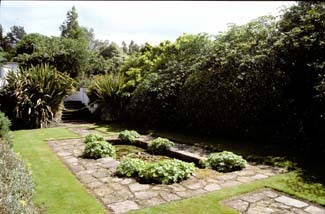 The garden, with mysterious paths leading off to hidden destinations, was laid out in the 1930s but planted by Mrs Frazer Mackie from 1948 to 1979 with rare trees, plants and shrubs, many of them grown from seed. 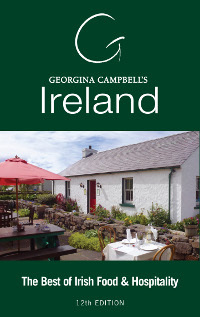 The area between the house and the road is laid out with shrubberies and island beds of shrubs set in manicured lawns. In the centre of the garden a huge lake-like lawn is surrounded by acers, magnolias, bamboos, turquoise blue hydrangeas, a huge stand of gunnera under a blue cedar and specimen trees. 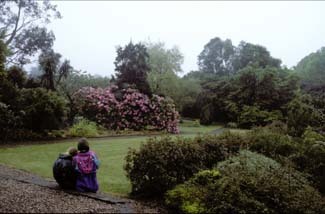 Paths burrow through glades of rhododendrons and camellias along a hosta walk, or an exotic walk planted with South African plants, including eight different varieties of agapanthus and flowering Beschorneria yuccoides. Another leads to to Mrs Mackie’s little circular garden with her special treasures S‘Guincho Purple’ , a champion Pseudopanax crassifolius, Hakea saligna and Myrtus lechleriana with its burnished copper juvenile leaves. In the valley, the stream walk is carpeted with spring bulbs - crocus, chionodoxia, scilla and grape hyacinths - and leads eventually to a waterfall. This area is being replanted sensitively under the supervision of Head Gardener, Nick Burrowes. In true Robinisonian manner the ground in this jungly area is populated by plants from around the world, including carpets of erythroniums (N America) Dicksonia antartica (Australasia) Dacrydium franklinii (Tasmania), Gevuina avellana (Chile), and large leaved rhododendrons like Falconeri, Fortunei and Thompsonii ranges, together with perfumed Loderii hybrids. The garden is now owned by Mr and Mrs Cairns, who kindly continue to open it under the national Trust Gardens open by appointment scheme.